The End of Paul’s Daughter As We Know It–Will They Return? 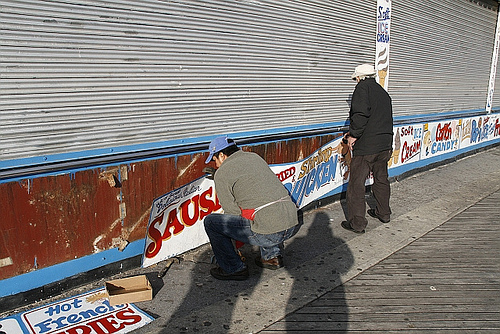 On Friday, Paul Georgoulakos and his help began the sad task of removing the hand-painted vernacular signage from Paul’s Daughter’s storefront, which he co-founded on the Coney Island Boardwalk in 1962 as Gregory & Paul’s. It was heartbreaking to see the cavalcade of beloved characters and foods torn from their home on the Boardwalk: Mr Shrimp, Chiefito and Chiefita (the Nice N Sweet/Fluffy Cotton Candy Kids), Shish Kebab (“Made with Love”) and other enticements. Some of the signage has been here since the restaurant’s earliest days and was meticulously restored a couple of years ago. The restaurant equipment was also cleaned, wrapped and carted off to storage. We have to warn you that the set of photos taken today by Bruce Handy is very distressing to look at. Paul’s Daughter as we know it no longer exists. If redevelopment is hell, we have probably entered the tenth circle of the inferno. In Bruce’s Coney Island Photo Diary slide show, you’ll witness the facade of the Boardwalk icon gradually stripped down to ghost signage. The burger statues on the roof, which we wrote about in “Photo of the Day: Coney Island Americana Looking for New Beach” (ATZ, October 13, 2011) are expected to come down this week. Will somebody please make a video? It will be a suitable companion piece to the video of the Astroland Rocket being removed from the roof. A new version of the iconic restaurant may or may not return to this spot, depending on how lease negotiations go with Zamperla USA. We’ll get to that in a minute and hope the possibility consoles you a little. There’s a rendering, which was shown at the AIA forum the other night–if you must see it now, scroll down. But first we’d like to pay our respects to the original Gregory & Paul’s, which became Paul’s Daughter in 2008. Here’s a photo taken in 2005 by James and Karla Murray from their celebrated book STORE FRONT- The Disappearing Face of New York. Today another legendary New York City store front has disappeared thanks to redevelopment and gentrification. The beloved seaside restaurant and its signage were featured in the 1999 music video “Summer Girls,” in which the band LFO danced on the boardwalk as well as on the roof in front of the Astroland Rocket. Taken as a whole, Paul’s store is a sublime example of the midway maxim “It’s the front of the show that gets the dough!” It’s a lesson that their new neighbor Coney Cones, which has a store front that would look at ease in Manhattan or Miami, but doesn’t stand out in Coney Island, is apparently unfamiliar with. Savvy restaurateurs are not necessarily successful Boardwalk concessionaires. In 2012, Paul’s storefront would have been fifty years old and eligible for nomination to the National Register of Historic Places. (Yes, there are examples of roadside architecture on the Register.) Now that will never happen. 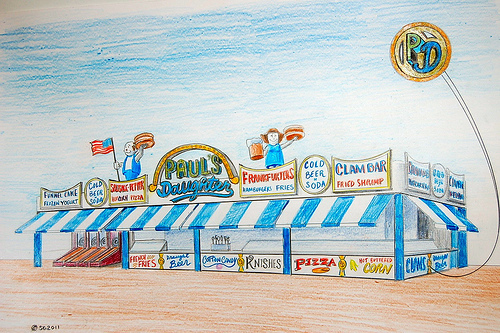 Instead Paul’s, Ruby’s and the other Boardwalk businesses are required to renovate and pay the high cost of the rehab–reportedly half a million to a million dollars–if they want to be part of the new Coney Island. Here’s our flickr slide show of photos of Paul’s Daughter that we’ve taken over the past few years. 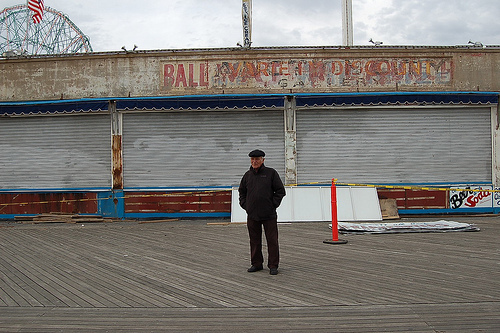 The removal of the signage does not necessarily spell the end of Paul’s Daughter in Coney Island, since Zamperla recently did an about-face from last year’s evictions and offered eight-year leases to Boardwalk favorites Paul’s Daughter and Ruby’s Bar. Negotiations continue with the store owners and a decision is expected after Thanksgiving, perhaps sooner, ATZ has learned. A number of clauses in the leases, which we previously described as onerous, have caused the negotiations to be extended beyond the original November 14 deadline, according to the Coney Island Rumor Mill. “It could go either way,” is the phrase we keep hearing in reference to both Paul’s and Ruby’s. Each of the Boardwalk Mom and Pops has been paying $100,000 per year rent, plus a $10,000 surcharge initiated this year to help keep the Boardwalk restrooms open later and for sanitation and fireworks. Believe it or not, $100,000 is also the base rent that CAI/Zamperla USA pays annually to the City. In addition, they also pay a small percentage of the gross receipts. For example, ten percent of gross receipts over $7 million. According to the NYC Economic Development Corporation’s lease with CAI (which ATZ obtained last year through the Freedom of Information Act), the City will receive 15% of the fixed rent paid by any subtenant. Zamperla gets to keep the other 85%. We think they have a pretty sweet deal with the City and should pass the sugar. We were pleasantly surprised by the renderings for Ruby’s and Paul’s Daughter. 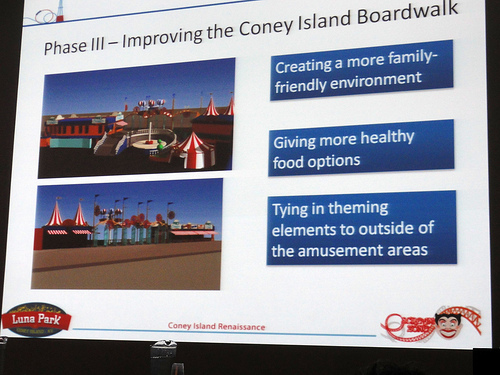 The Boardwalk will not after all be rethemed as an orange-and-blue advertisement for Luna Park as previous drawings have suggested. Paul’s Daughters’ rendering for their proposed store shows the spruced up Burger People on the roof and what appears to be new hand-painted signage along the bottom. Stay tuned for our report on the AIA panel and the renderings of the other Boardwalk businesses. on November 14, 2011 at 12:09 am | Reply Lisanne! So if they do enter into a lease they are expected to reinvent their signage, which will resemble the old signage. At least it appears that way. I wish they would have just left the signs there until things are resolved. The new signage, including that of the other stores, is very elaborate lighted signs. Must be expensive too. Very sad, very poignant. Your blog has become an essential document of the change trying to sweep old Coney away. The architect’s drawing is quite nice. I will cling to the hope that Paul’s Daughter will be back, burger folk and all. Literally bought tears to my eyes. The character, the soul of Coney, dismantled and laid aside. Our world is less magical today. There was a wedding party there taking photos, using the Coney Island magic one last time. Back in the days before Giuliani that used to be called “paying protection”! CAI Zamperla is starting to show what seems to be a thug mentality. In a recent feature on Ruby’s for the BBC, Valerio Ferrari said that it “doesn’t matter what a couple hundred people want” as far as his plans for Coney Island go. I find it astounding that he/they claim to love Coney Island, and at the same time are doing everything in their power to stamp out any remaining traces of it. Between them and Joe Sitt’s machinations, I don’t know which one is doing the most harm! Why must we lose the last few vestiges of our glorious past in order to bring Coney Island into the 21st Century? Why can’t there be room for BOTH the old and the new side-by-side? Well I took a look at my slide show of photos of Paul’s. It seemed like I had already taken a lot of pix, but now I’m sorry that I didn’t take more. Will have to see if there are photos that I didn’t upload to flickr. One can never take too many photos of Coney Island! “Healthy food options”?!? What, clams on the half shell are not healthy enough for them? Who the hell do they think would come to Coney for a salad and a fruit cup?